I've been thinking about writing a blog for a while. I wanted a place to write about materials and document my life as a (fairly new) illustrator but I've always put it off thinking it would be a big commitment and far too time consuming. Well here it is, with no promises of regular updates or quality content, my first blog post! October is one of my favourite months in the social media calendar because- you've guessed it- it's #inktober month! For anybody who is wondering what it is, a whole bunch of artists post a drawing made in ink every day throughout the month of October, mainly on twitter and instagram, and tag it with #inktober and #inktober2017 (or whatever the year is). 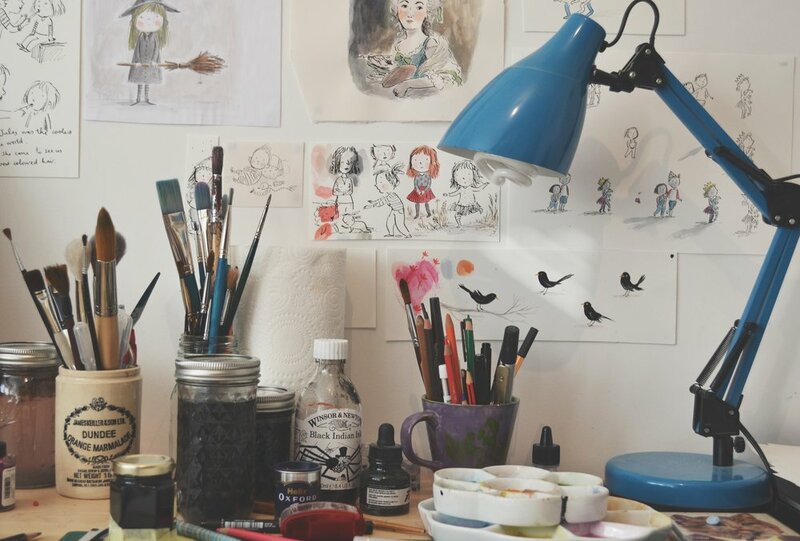 For lots of people this is a chance to use a medium they don't usually use and the challenge of drawing something every day can really help you improve your drawings. I already use ink so I'm a bit of a cheat, but it's really fun and anyone can join in so if you have the time, give it a go! In previous years I've just drawn something random every day but I'm thinking of doing a theme this year (possibly dogs? I'm not sure yet...) There are also prompt lists if you need some inspiration, follow @inktober on twitter or instagram for the official one. You can really use anything inky you like. You are encouraged to get messy and use real ink but some people may prefer to work digitally for various reasons. I use a variety of nibs but my favourite is the Leanardt 256, it's fairly robust and just the right amount of flexible once you've 'drawn it in a bit' as I like to say. There are two sizes of nib holder- the larger being for most drawing nibs and the smaller for the mapping nibs which are useful for fine detail- I'd recommend getting a starter kit to try out both holders and a variety of nibs to see what you like the feel of. Once you have your new nibs you'll need to prepare them for use by removing the waxy protective coating they come from the factory with. This can be done by gently scrubbing with soapy water or (my favourite technique) sticking the nibs into a potato for 15 minutes! Strange I know, but it really works. Make sure you dry off your nib afterwards to prevent it from rusting. My favourite ink is Winsor and Newton indian ink because it is waterproof so you can paint on top of it when it is dry- big bonus! Other brands that are popular are Higgins which is slightly more matt when dry but still nice and waterproof and Dr PH Martin's Bombay India inks which are the only coloured inks I've found that are completely waterproof. I recently bought the sepia one which is really nice. Once you've got your ink and dip pen all that's left to do is get started! 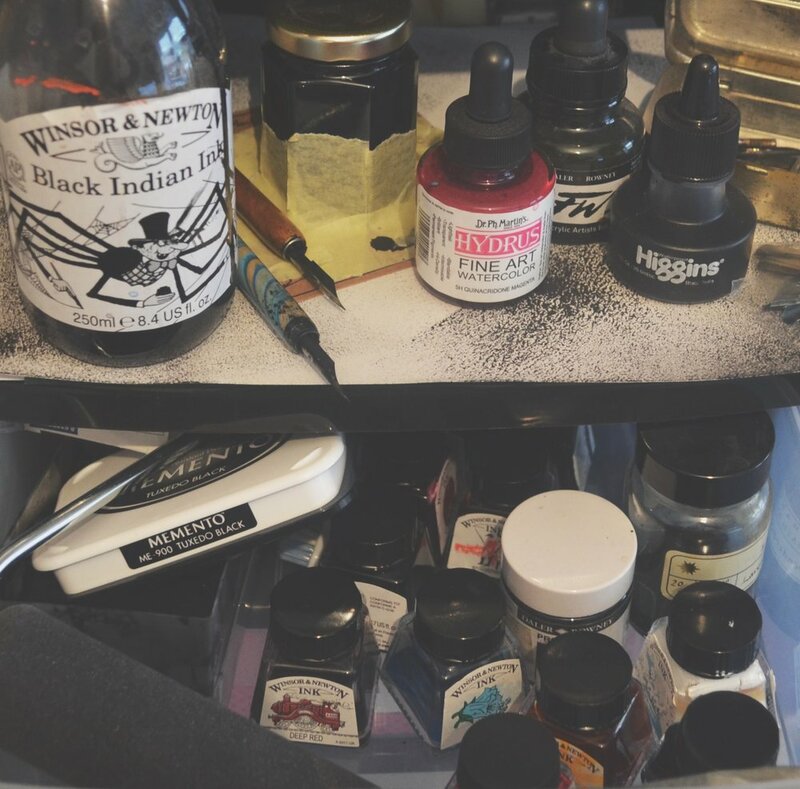 I keep a jar of water nearby to clean my nib in between drawings as the ink will dry onto your nib and clog it up if you leave it for too long and a roll of kitchen or loo roll to dry it off on. If your nib needs a proper clean then use a toothbrush and washing up liquid to gently remove any ink.